Since the day Apple moved to the Audio Unit format users have been forced to view an illogical list of manufacturers and developers names when trying to access their plugins. Not anymore. Now you can organise and view your Audio Units the way you desire in Logic, Garageband, Main Stage with limited support also for Ableton Live, Maschine and other AU hosts. Using everything you're already familiar with in OSX, Auganizer gives you all the tools to arrange your Audio Units like never before. You can now change the developer/manufacturer name and use a much more logical workflow orientated layout. You could, for instance, arrange by the type of effect, and we even allow you to go further by making multi layers with sub folders. This gives you the ability to create hierarchies such as; "Compressor > Multi-band" and "Compressor > Single-band", so you have full control over how YOU want your plugins organized. Further more ALL your changes are compatible with old projects. You can even import/export and revert settings at the start or end of any individual sessions, 100% compatibility! One of the reasons we created this app is because we found it difficult to remember what each plugin in our long list did when arranged by developer's names. We realised this same problem existed when faced with a list of plugins to rename. To combat this we implemented OSX's native coverflow. With a click of a button coverflow will load up the plugins GUI's so you can be easily reminded exactly what each plugin is and where it should be categorized. The interface is familiar for all Mac users. Upon opening the app all your Audio Units will be scanned in both user and system folders. 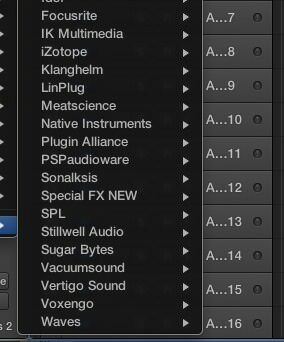 You can rename and edit the plugins one by one, and you can batch edit the categories at once by click and highlighting multiple plugins - making it easier to arrange them into folders like compressors, filters, EQ's, etc. 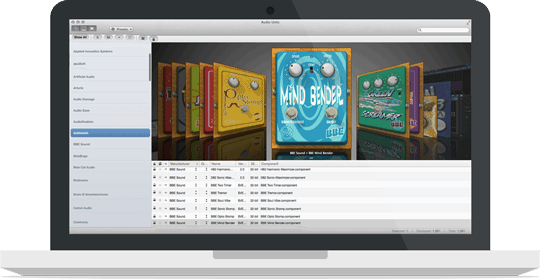 All the tools you need to manage your Audio Unit library. Auganizer is FULLY compatibility with all old projects. You're free to make as many changes before, during or after any session or project and ensure all settings will always be recalled. Coming in v1.0.2 user generated Logic presets will also automatically follow your plugin renames around. Auganizer supports OSX 10.6 upwards to and including 10.10 Yosemite. 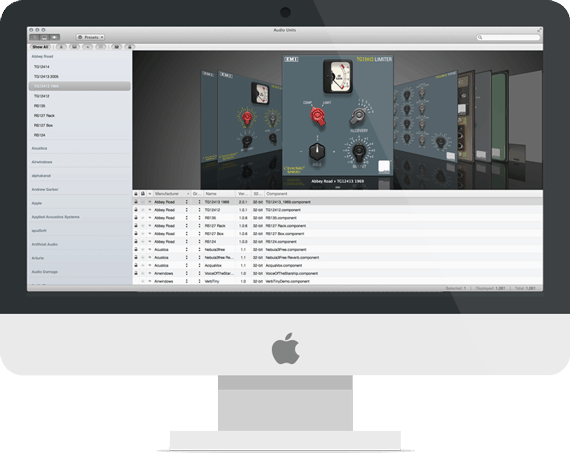 It fully supports Logic 7, 8, 9 and X as well as Garageband 8, 9 and 10. Auganizer also has limited support for a number of other Audio Unit hosts with a growing list. It supports both 32bit and 64bit plugins as well as 32 Lives, Automap and other plugin wrappers. The app supports backing up of all your settings and changes, including import and export (useful for multi users), Simple revert to stock options, backing up per change so you can roll back to previous changes, the ability to re-apply your updates to plugins you have removed then re-added or upgraded. Auganizer is priced at just $34.99, a bargain for an app which can revolutionise your work flow saving you time, money and making your work much more enjoyable. We hope it becomes a studio staple for all engineers, producers and writers working with Audio Units. You can buy Auganizer for the fantastic price of just $34.99 or you can download a feature limited demo below, right now! Some of your more commonly asked questions, answered. 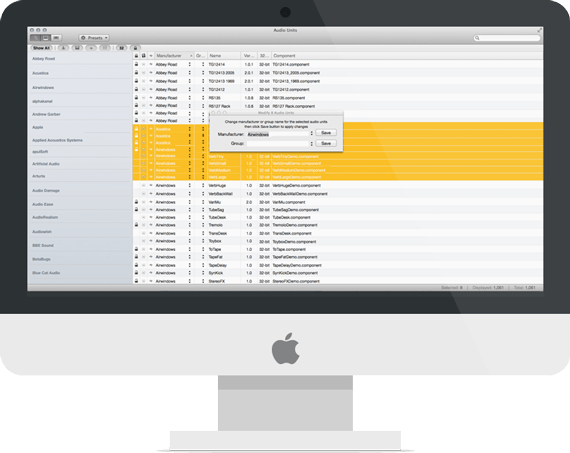 Auganizer works on OSX from version 10.6 upwards to and including 10.10 Yosemite. 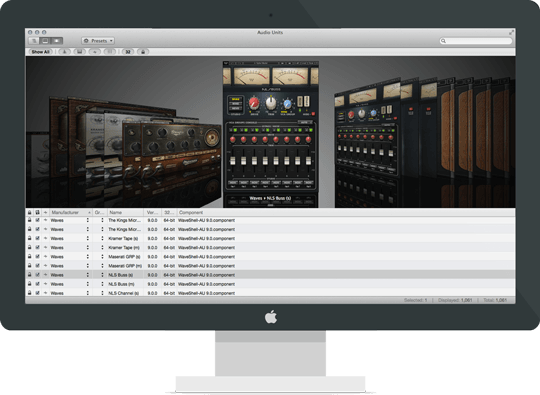 It fully supports Logic 7, 8, 9 and X as well as Garageband 8, 9 and 10. Auganizer also has limited support for a number of other Audio Unit hosts with a growing list. No, we've written Auganzier so that all your changes can be made on the fly, no need to rescan your plugins for changes. Each time you close your sequencer and reopen it your changes will be available. NO RESCANS NECESSARY! Simple, easy and fast. Can it damage old sessions? No, Auganizer changes do not affected old sessions in anyway, see https://www.youtube.com/watch?v=BGLtVUD0vnA. Further more all changes are non destructive and easily reverted to stock if need be. Yes you can. We offer a demo to download on this page which will allow you to rename ten plugins to show you how the app works and how easy it is to organise your plugins. Can I reverse my changes? Yes, the original setup is backed up and can be restored within the press of a button. Not only that but you can save your setup and other setups and import them at any time, making it easy to apply your own setup on a multi-user machine and studio environment. How does your license work? Currently you purchase through Paypal and your license is for one system. If you have a second system you'd like to run Auganizer on send us an email to [email protected] explaining this and we'll be happy to provide you with one. We are a new development team making original, intuitive and beautiful apps to solve various problems. Auganizer is the first release from our studio. Mac, OS X, Cover Flow, Logic, Logic Studio, Cocoa, Garageband, iMac, MacBook, MacApp and Retina are trademarks of Apple Inc., registered in the U.S. and other countries.